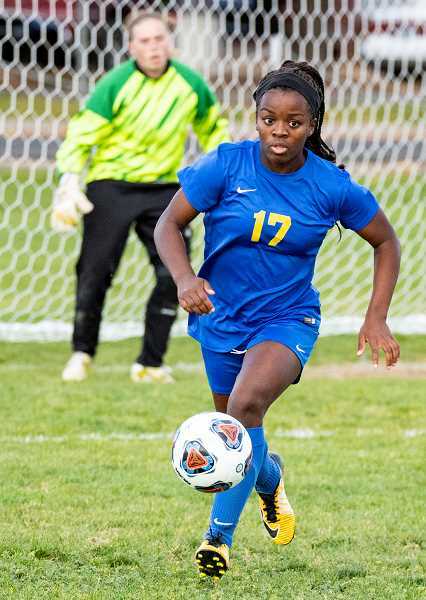 The Ridgeview Ravens scored early and often as they rolled past the Crook County Cowgirls 8-0 Tuesday afternoon in an Intermountain Conference girls soccer game. Despite the loss, the Cowgirls were in good spirits following the match, eating homemade cookies and drinking juice. 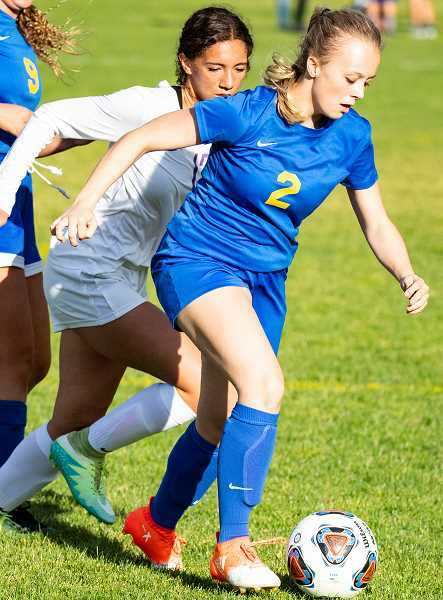 "The past couple of games have been really tough," said Crook County senior midfielder Heather Ptomey. "I feel like we haven't been playing with as much heart, but today, this game, we played with a lot more heart. We were a lot more aggressive on the ball, being first to it, and clearing it out of the box. I feel like we played a good game." With Ridgeview totally controlling the time of possession, Crook County still played staunch defense in front of their goal early in the contest. However, the Ravens broke through into the scoring column 9:22 into the game on a goal by Justice Williams-Orlando. Once Ridgeview finally scored, the floodgates opened as the Ravens scored five more first-half goals. Sadie Benz was the star for the Ravens, scoring four consecutive goals as Ridgeview pulled away to the big halftime lead. Grace Sorensen scored the final goal of the half for the Ravens with 6:32 remaining in the contest. Crook County had their first chance to score two minutes later when Shelby Squier took a direct free kick from 25 meters out on the left-hand side of the field. However, the shot sailed harmlessly over the goal, leaving the Ridgeview shutout intact. Ridgeview moved players around on the field in the second half, moving some of their scoring threats to midfield, and going heavily to their bench. Meanwhile, Crook County also made some adjustments, switching stopper Emma Hehn to forward and moving other players back on defense. Regardless of the cause, the Ridgeview offense sputtered most of the second half. Ridgeview's Averi Hartford scored a goal 11 minutes into the second half, making the score 7-0. The Ravens did not score again until time was running out as Scout Bale put a ball over Crook County goalkeeper Hazel Hoffman's head with just seconds remaining in the match. Like in the first half, the Cowgirls had just one scoring opportunity in the second half. Hehn broke free of the Raven defense midway through the half and looked like she would have a one-on-one shot against Ridgeview goalkeeper McKinley Lockridge. However, a pair of Ridgeview defenders caught up with the play and forced Hehn into an early shot, which sailed harmlessly to the right of the goal. The Cowgirls did get one more scoring opportunity on a direct free kick but were unable to put the ball on goal. With the win, the league-leading Ravens improved to 4-3-1 overall and 4-0 in conference play, while the Cowgirls fell to 2-7 overall and 0-4 in conference. Crook County played at Redmond (2-6, 1-3) on Thursday. The team then has a week off before hosting The Dalles/Dufur on Thursday, Oct. 11 in a 4:30 p.m. match.